You will definitely have to replant each year. These will not withstand your temperature range. It can be grown in the warmer months, but will not do well when it is cold. 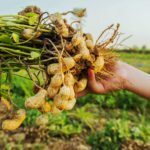 "Wild Peanuts" can be aggressive, but they just will not tolerate the winters you receive there. This will be best used as an annual.